Think you can spot the leaders in your company? Don't assume that you can identify them by their positions. What about those employees who consistently step up: the field agent who solves a previously intractable problem, the service rep who thinks outside the box and creates unshakeable customer loyalty? These are more than "good employees". - these are "hidden leaders", and they are critical to an organization's long-term success. Like his other fables, Silos, Politics, and Turf Wars is fiction in realistic form, involving not one, but three organizations, all struggling to eliminate their silos and bridge a sense of alignment back in place. This audio comes with a bonus interview and introduction read by the author. 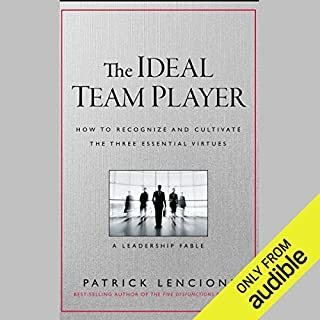 Like many of Lencioni's books, the information in this book is played out through a realistic business scenario with a comprehensive review of the model at the end. 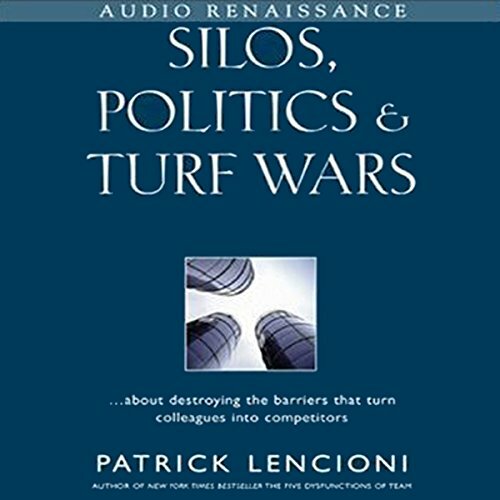 Lencioni defines silos as barriers between departments that make them work against one another. Other words for silos are departmental politics, divisional rivalry, or turf warfare. Lencioni claims that silos happen because leaders don't provide a compelling context for working together. While that is true, the model he proposes seems somewhat simplistic for an organization that has been experiencing years of dysfunctional behavior. Years of conflict will not be resolved by simply defining goals and objectives with accompanying metrics. Human behavior isn't that straight forward. In addition to defining a purpose, organizations may need to rebuild trust, learn to work as teams, and develop better leadership and communication skills, to name a few. Lencioni's model provides a good start, but in my experience, it's incomplete. 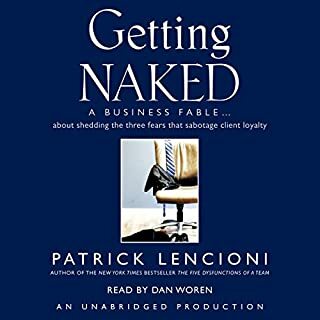 Another Lencioni masterpiece. I couldn't have been more pleased with the story and the strategy to overcome the silos! I really appreciate the clarity and simplicity he brings to these issues. Great to be aware of but so much words to say the idea! Good but simple! Great book! 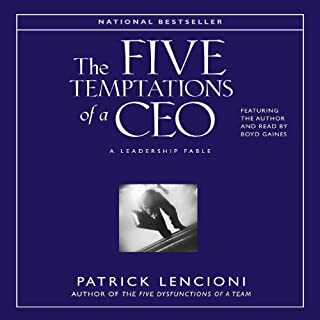 I've read most of Patrick Lencioni's books. This one is just as good as his others. Geared towards a big or bigger compnay. It's a quick read. For all of us who have have opportunities to work in cross departmental teams and change management, this is for you. In order to tear down silos you first have to understand how they are built. Great read! Silos are real and creating collaboration will continue to be a critical focus of successful organizations. I've listed to this 3 times and review it quite frequently. Has been relevant to my business relationships. Every book is incredible, every book will save you a lot of money and time. Adding this one to our company library for everyone to read. I like the storytelling aspect of the book. silos are tough to address in any leadership role and this gives you a bit of an edge. It gives a rounded approach towards the issue of silos, catering for a broader audience than the other two books. The biggest issues stopping a large company from excelling at their strategic goals - Silos, Politics and Turf Wars. Just as true today as when it was written. Narrated by the author - so you know he speaks with authority and passion on the subject. 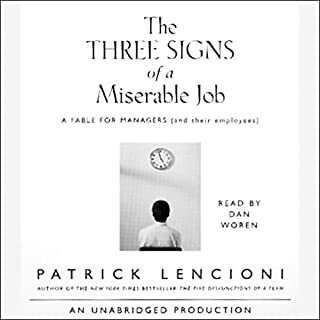 Having experienced all three of these issues in my own corporate experiences, I found this work entertaining as well as informative and deeply relevant. 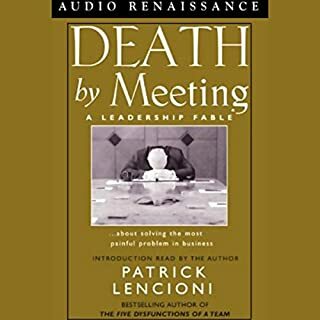 Lencioni is perfect listening. easy on the ear and to retain. great strategies for leaders.